Interested in this book? Stay tuned for a giveaway! Logan Langley is just months away from his thirteenth birthday and the biggest day of his life- the day he will finally be Marked. The Mark lets people get jobs, vote, and even go out to eat or buy concert tickets. Logan Langley cannot help but be afraid of the dark. While other kids his age might poke fun at him if they knew of his fear, Logan knows that there is something lurking in the shadows, constantly watching him. He does not know who, and he does not know why, but he knows that someone is there. As his 13th birthday draws closer, he prepares to receive his Mark and make his Pledge, officially becoming an adult. However, his paranoia over the Pledge increases as recalls his sister’s disappearance after leaving to get Marked, and when he finds a wire in his room proving he is being watched, he begins to discover that not all is how it seems and getting Marked might be more dangerous than he initially thought. Swipe is what I consider a ‘true’ dystopian novel. There has been an inundation of YA dystopian literature recently, but many of the books seem to have hardly any dystopian elements or the future world/people created are rather unrealistic. However, Swipe has abundant dystopian components, and the future reality of the world that Angler provides is so plausible it is scary. 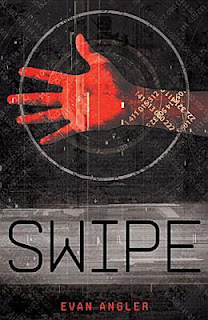 In fact, certain characteristics of Swipe remind me of Aldous Huxley’s Brave New World (which shall forever be one of my favorite books). The world building is fantastic and it is easy to envision how the new world looks and functions. Angler does a brilliant job explaining how everything comes to be and I loved discovering more about this futuristic reality. The intensity of the book picks up slowly until it is literally non-stop action and plot twists. The beginning was a bit creepy for me (especially since I am a big wimp who is still afraid of the dark at my age. I wish I was kidding *sigh*). When Logan felt like he was being watched and when he found that wire, I was literally shaking in my boots myself. Then the story begins to unfold, discoveries are made, there is plot twist after plot twist, and I found myself completely enraptured. I liked the two main characters, Logan and Erin. I connected with Logan quickly (and for more reasons other than the fact that we have a mutual fear of the dark). He is a very likeable character who is mature and smart for his age. Even when adults tell him he is wrong or mentally unstable, he is steadfast in his beliefs, and I appreciated that about him. The same can be said for Erin. I loved the interaction between the two of them, and I thought their budding relationship was adorable. I am hoping to see more of them together in the next book! Overall, this was a great read and one of the better dystopian books out there for teens. Swipe is listed as middle grade, but it actually reads more along the lines of a normal YA book, and I think anyone of any age will enjoy it. If you are looking for an engaging, fast-paced read in a well-crafted dystopian world, look no further! It is giveaway time! WHOO-HOO! This is a new book and author for me. I'm a huge dystopian fan, so this definitely caught my eye!